I was very keen to try making this dish after eating it at Ripples Milsons Point in Sydney. It’s not a revolutionary recipe and it’s been around for yonks, but it doesn’t take that much time to prepare and is actually quite a simple recipe in terms of it’s components and cooking method. Believe it or not, I have never attempted to cook scallops before, one of the easiest things too cook and actually not as expensive as I thought they would be. I cleared out the scallops at GrEAT and bought 12 pieces of scallop meat for HK$282 to cook as a starter portion for 4 people. It is a dish that feels quite grand, will impress your guests, and you can have a little silent chuckle with yourself whilst they eat it up, because it was just that easy to make. The petits pois were in the freezer – smaller than the US brands of frozen green peas, they are picked young when they are sweeter. I find they keep their colour better, and are more crisp. The bacon was in the fridge too, so I used that instead of pancetta. You could use pancetta cubes as well if you want. The truffle cream is not necessary, but it looks pretty on the plate if you can be bothered. I had black truffle paste in the fridge from a previous dinner party, so I stirred that into some crème fraîche and hey presto! Allow me to digress, but whenever I hear the words ‘crème fraîche’, I am always reminded of that hilarious South Park episode featuring an emotional Jamie Oliver, an aggressively passionate Gordon Ramsay, Mario Batalli, Paula Dean and Giada de Laurentiis – and let’s not forget the Shake Weight. Or the cream freeeesh. Definitely one of my favorite episodes! Ok, now back to the cooking – try out the recipe, you won’t regret it. This recipe serves 4 as a starter. ♥ Make the minted pea purée. Melt half of the butter until hot and foaming in a deep skillet and soften the onions. Add the petits pois, sugar, stock and the rest of the butter. Make a drop lid from greaseproof paper: cut off a piece just bigger than the skillet, fold it in quarters and use scissors to cut the edge in a circular shape. Cover the peas with the drop lid and simmer over low heat for 5 minutes. ♥ Remove the drop lid, stir in the mint and cream and cook briskly for a further minute or so until the liquid has almost all evaporated. Pour the pea mixture into a food processor and blitz into a purée that still has a bit of chunk to it. Set aside. 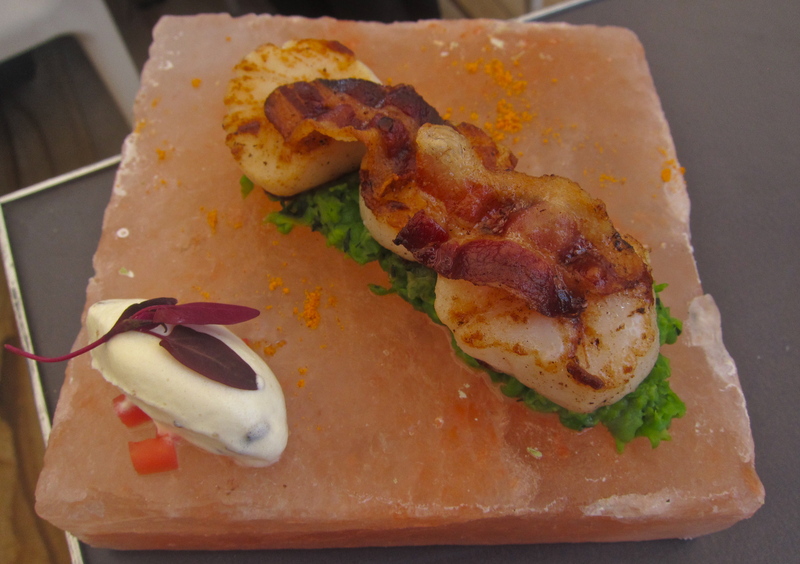 ♥ Cook the scallops and the bacon. Season the scallops with salt and pepper, heat a griddle pan and melt 25g of unsalted butter, then sear the scallops for one minute on each side. If there are one or two pieces that are a bit bigger then cook them for a little longer, but don;t be tempted to cook for too long – they’ll get rubbery. Meanwhile, fry up the bacon. ♥ Plate it up – I did it exactly like they did at Ripples in the picture above. It was so good that I didn’t have time to take a picture!